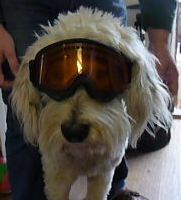 At least someone is ready for the snow…. 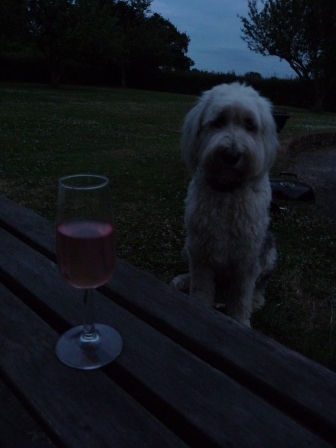 The Rhubarb Schnaps is finally ready……….no further comment required!!!! 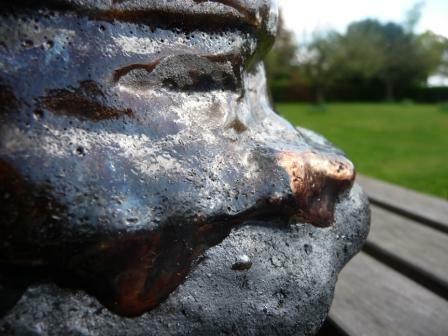 Interesting results from the raku firing. 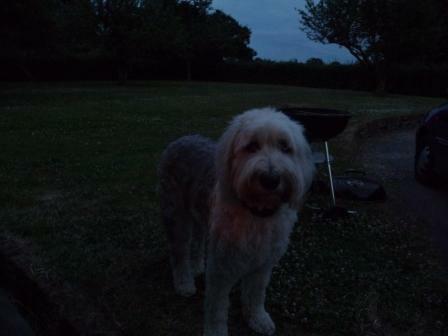 I am definitley getting more adventurous….. Fantastic swirls of shiny copper from the copper oxide applied on top of the glaze. The red commercial glaze always produces reliable results, some might find comfort in this consistancy, but I find it dull and uninspiring. It always does exactly what you expect it to……what is the fun in that, hardly the spirit of raku. 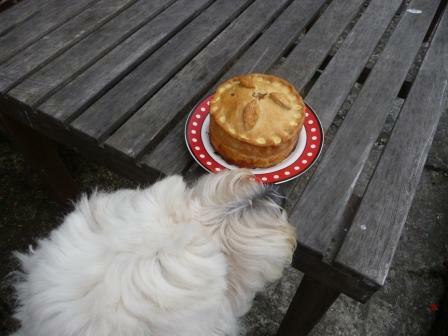 Sadly the rim burst off my favourite piece, but casualties are to be expected. The rim was thicker than the rest of the pot and there must have been an air bubble in the clay when it was made. Really pleased with the effect of the glaze combination though on the remaining pot (see close up picture above), so will try and replicate this next time. 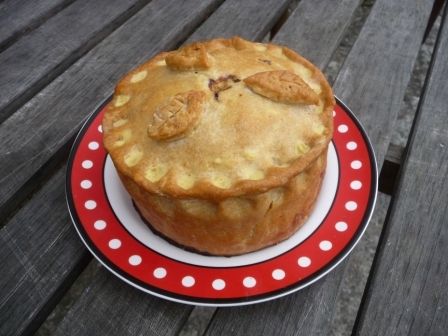 On consulting with others, had the rim remained in tact, it turns out I am the only one who would have liked it anyway…..fine…..they obviously still need to be enlightened…..
Oh, and if this wasn’t more info than you needed about rhubarb, you really indulge yourself with the Rhubarb Compendium….enjoy! 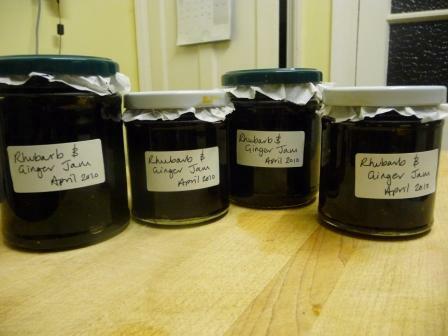 The Jam - Can you believe....only 4 small jars from 2kg of Rhubarb...where did it go? 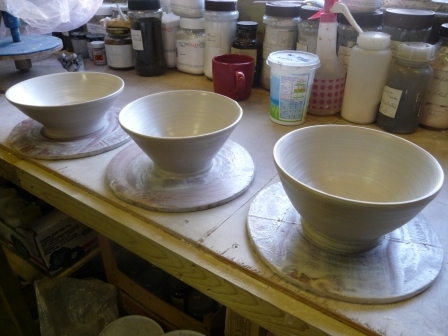 More throwing practice tonight and after a shaky start managed to produce these 3 bowls. Last weekends firing produced one breakfast sized bowl, which we have been fighting over ever since. 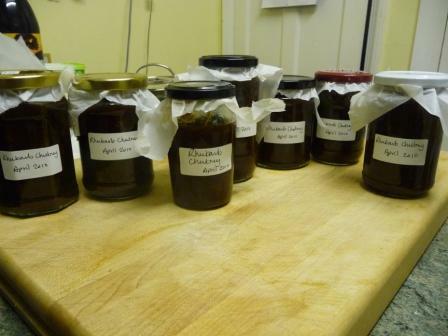 Attempting now to make some more so that we can have one each…and maybe a few spares. I’ll be able to get through some of that porridge with bowls this big. 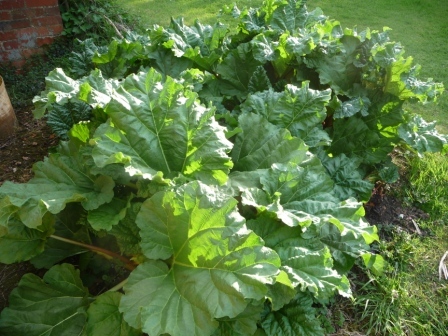 The most enormous patch of Rhubarb has appeared outside the window of The Potting Shed. I didn’t even really notice it growing, then all of a sudden it is in season and ready to pick. I have always wanted a Rhubarb plant, so am very pleased. 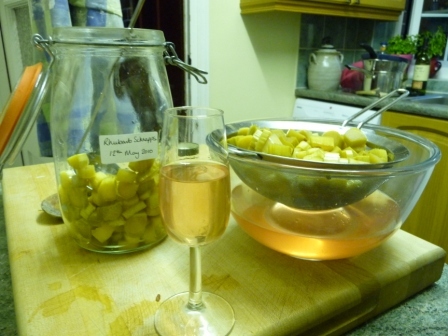 Rhubarb crumble and custard for pudding last night, going to try my hand at jam making (Rhubarb and Ginger), stewed rhubarb for breakfast……A quick search on the web found suggestions for rhubarb wine…..sounds good. 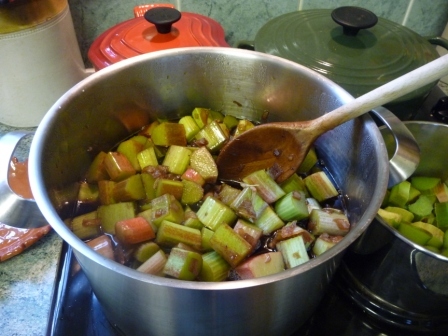 I think I will fill freezer with rhubarb so can eat for the rest of the year…..yum..